Season the beef with kosher salt and black pepper. Roll edges of vacuum pouch back an inch or two to prevent cross-contamination. 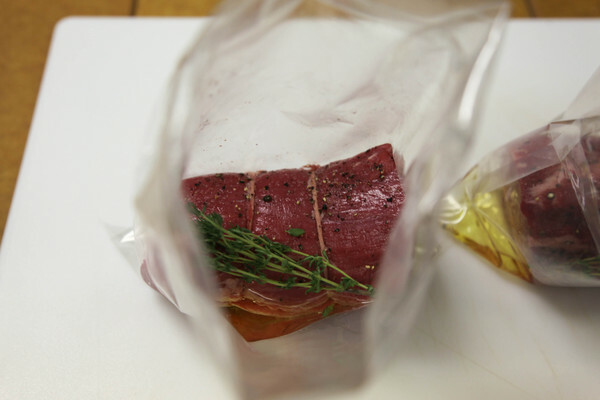 Place beef into the bag, along with sprig of thyme and black truffle olive oil. Do NOT use dairy products, such as butter, in cook times exceeding 4 hours. 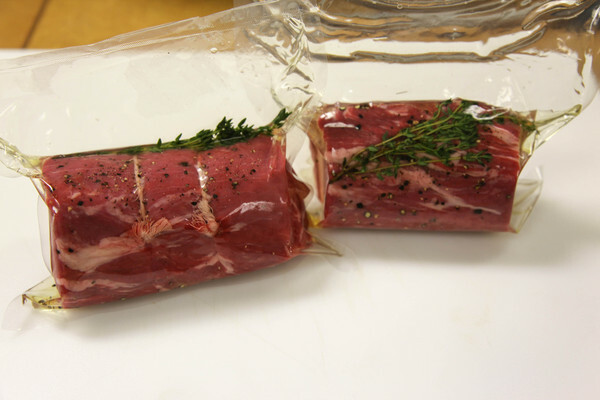 Vacuum seal beef to 95% vacuum or greater. Place in circulating water bath and cook for 60-90 minutes, or until target core temperature is reached. Remove cooked beef from bath and carefully open pouch. 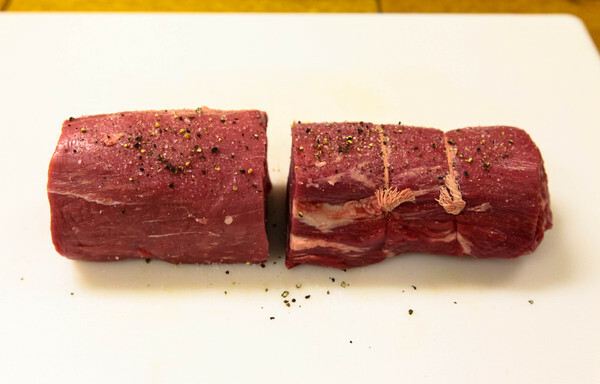 Remove beef, gently dry on paper towel to absorb excess moisture and sear evenly in hot pan or grill. Remove seared beef from pan, rest 60 seconds and slice. Sous vide beef does not require but a few moments to rest. 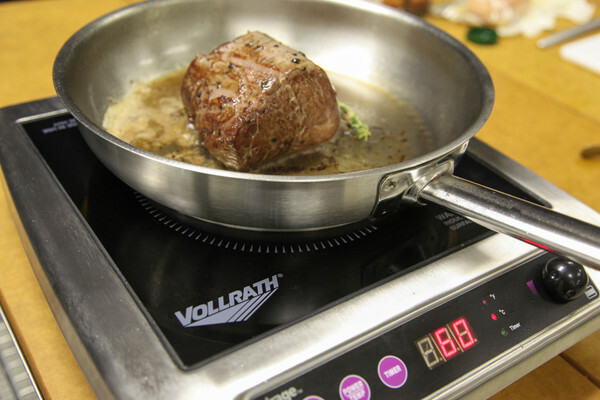 How many number of pounds or kilos can you Sous Vide at a time? Hello Jason- The suggested approximate cook time is 60-90 minutes, as it appears in the text of the recipe. Note however that this is only an approximation. 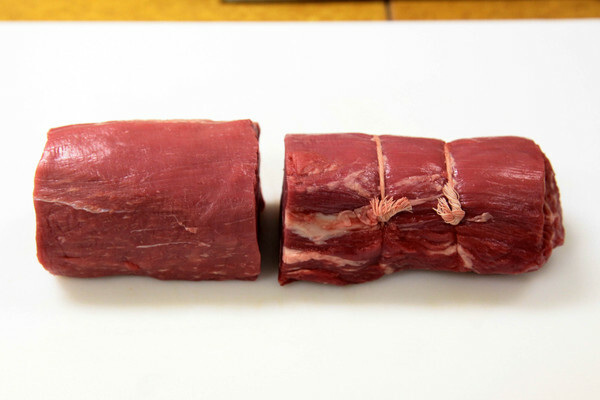 The amount of time that it takes for a tender cut (in this case- Beef Tenderloin) to cook is determined by the thermal conductivity of the specific protein. This varies from pork to beef to fish etc. Another determining factor is the shape of the protein. Is it a cylinder, cube, slab, etc. Lastly, another factor at play (and the most important of them all) is the thickness of the piece of food to be cooked. Try having a look at our iOS app, The PolyScience Sous Vide Toolbox, for further clarification or the cooking time charts as printed in Modernist Cuisine, Modernist Cuisine at Home, and Immersed. In short- giving specific cook times for the cooking of proteins, especially those with great thickness, is tricky because it really depends on and differs from steak to steak. When discussing cooking temperatures for tender cuts of protein, the choice really comes down to the degree of doneness that you prefer. Do you like you steak cooked rare? Medium well? Well done? The choice is really up to you. You can also do a whole smoked pork sholedur (it already comes vacuum packed in food grade plastic at the supermarket) in the instant pot for 24 hours at 65C. Just put it in and fill with hot water from the tap. Set the instant pot to keep warm with the lid off, and then unwrap and eat 24h 30h later.